Enjoy a bit of fashionable flair with this fine and stylish vintage equestrian themed red silk tie in a vivid red, blue and gold, by Paolo Gucci, circa 1990s. 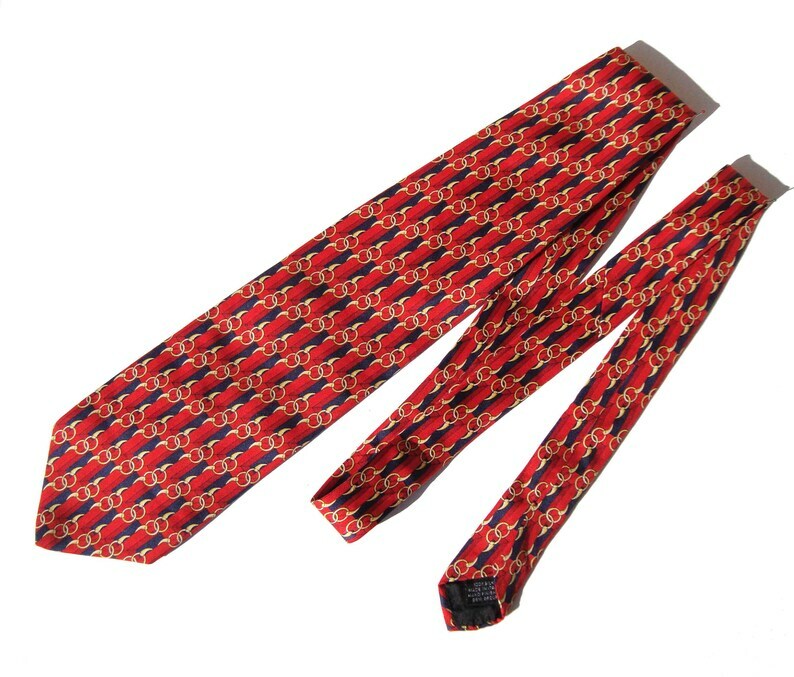 The elegant men's necktie is comprised of a smooth silk with bright red and navy blue geometric print, and repeating pattern of gold hoops that appear to be part of a horse bridle. The tie is fully lined within and imprinted with the company's crest logo -- and measures approximately 4 inches wide across the blade by 58 inches in length. It also has a label for "Designed by Paolo Gucci" along with a fabric care label which includes, "100% Silk", "Made in Italy", "Hand Finished", and "Gem Group".